EgYpTian CUsIne FroM an EgyPtian WoMaN: Molokhia with Shrimp. this is not how i grew up eating molokhia, but its a variation that I really enjoy. Its molokhia with shrimps and suprisingly it works! I love tearing up lebanese bread in it then eating it with a spoon. You will enjoy this for a nice change. 2 cups of fish broth or Chicken broth (you can use a bullion cube which is what most people do). Heat the fish or chicken broth. Add frozen molokhia. 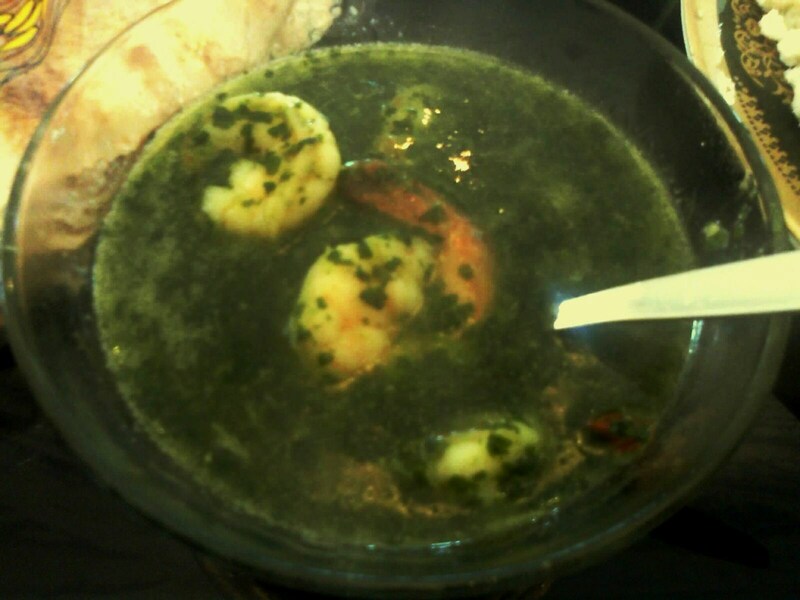 When all of molokhia is dissolved, add the prawns and wait until shrimp cook through. In a small pan heat butter and add garlic and corriander combined. Saute until golden brown and add to molokhia. Season the molokhia with salt and pepper and test to see if shrimp are cooked. Enjoy this tasty soup with lots of bread and water because it will make you thirsty! Same as I do it, lovely.